What a season for Hawthorn. Not only did they win their 12th premiership in the most emphatic fashion yet, they also proved that there is indeed life after Lance “Buddy” Franklin. 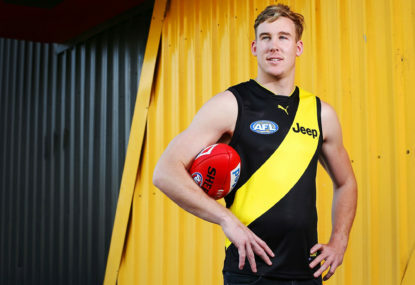 Prior to the start of the season, the question that many were going to ask was whether the premiers could move on from the departure of one of their most-loved sons. Only a third into the season and we got the answer – yes. Let’s now look back at what can only be described as a phenomenal season for Hawthorn. 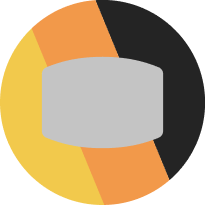 Hawthorn were able to achieve what hadn’t been done since the Brisbane Lions’ hat-trick of flags between 2001 and 2003 – successfully retain the flag. And they did it in style, more of which will be recapped later. 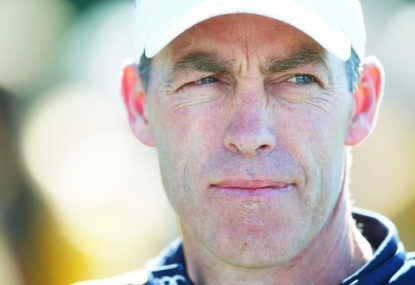 They were also able to overcome the brief absence of Alastair Clarkson for all of June, after he was struck down by illness midway through the season. With caretaker Brendon Bolton in the hot seat for five matches, the Hawks went undefeated. Captain Luke Hodge also cemented his place as one of the all-time greats at Hawthorn, winning a second Norm Smith Medal to go with the one he won six years ago when the Hawks stunned Geelong to win the 2008 flag. Bolton’s first match as caretaker coach very nearly resulted in an upset loss to Greater Western Sydney in Round 11. Only a seven-point win in the end prevented the Hawks from suffering what would have otherwise been an embarrassing defeat to the AFL’s newest club. 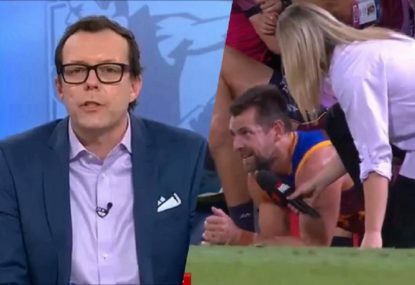 Brian Lake made headlines for the wrong reasons in Round 16 when he appeared to choke North Melbourne’s Drew Petrie during the heated clash against the Kangaroos, which saw Alastair Clarkson return from his illness. His ill-discipline was one factor that contributed to their shock 20-point loss. As far as wins in 2014 go for the Hawks, none was more emphatic or impressive than their 63-point demolition of Sydney in the grand final. In 2012, the Hawks entered as heavy favourites and had the burden of that on their shoulders, and subsequently lost the big one by 10 points. This time, all the pressure was on Sydney and it was them who crumbled, leaving the Hawks to revel as underdogs. That they did with arguably the best football produced all season, as they put the Swans on the back foot from the get-go despite conceding two of the first three goals. The eventual 63-point margin also put an exclamation mark on their ability to move on from Lance Franklin’s departure. If Geelong could do it (they won the 2011 premiership just twelve months after losing Gary Ablett Jr to the Gold Coast Suns), then so could the Hawks. And that’s what they did. 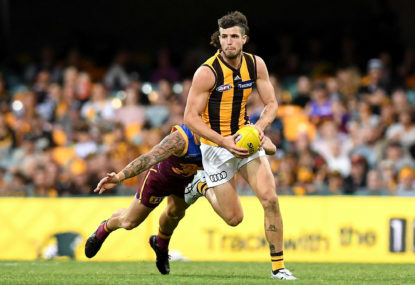 The Hawks entered their Round 16 match against North Melbourne heavily favoured to account for a team which suffered a narrow but humiliating loss to the Brisbane Lions at the Gabba the previous round. 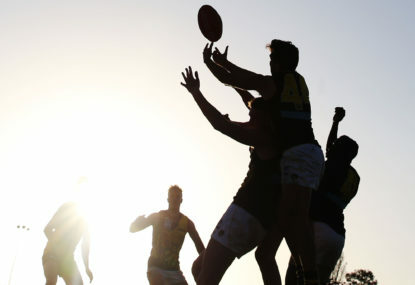 Instead, they were made to cop the anger inflicted by the Kangaroos as coach Alastair Clarkson, resuming normal duties after being sidelined due to illness, was welcomed back with a 20-point loss. It was in this match that defender Lake clashed with opposite number Drew Petrie, who kicked five goals for the evening. His choke job made headlines around the world and he was subsequently rubbed out for four matches by the judiciary. Compounding the Hawks’ woes, Brad Sewell was subbed off in the first quarter after suffering a hamstring injury early in the match. The 20-point loss ended up being their worst marginal defeat all year. Having secured back-to-back flags for the first time since 1988-89, the Hawks will now look towards their next goal, and that is trying to emulate the Brisbane Lions’ in winning a third consecutive premiership. Sewell is so far the club’s only major loss, having announced his retirement after 200 games and after being overlooked for grand final selection last month. However, his loss has been offset by the arrival of Melbourne’s James Frawley, who will play under his eighth coach (including three caretakers) after choosing to continue his AFL career at the two-time premiers. Frawley’s arrival will see him join Lake and the in-and-out Ryan Schoenmakers in an already-strong defensive structure. The lure of achieving premiership success is what enticed him to make the switch to brown and gold. With Hawthorn’s premiership window still wide open, there is every chance that the powerhouse side of the last few years can go for a hat-trick of flags. Can it be achieved, or will the Brisbane Lions remain the last side to do it?